LOPO China is a family-owned corporation established in 2002 by the couple Mr Xinghua Peng and Mrs Meiyu Yang. Over the past decade, LOPO China has become the major manufacturer of architectural terracotta product in mainland China. Now we have set up 3 factories in Fujian province, which are LOPO Clay Tile, LOPO Terracotta Facade Panel, LOPO Artificial Stone. Equipped by advanced production lines imported from Italian, excellent technical team and more than 600 skilled workers, we are capable of providing high-quality and environmentally-friendly products with extensive range of colors, textures and sizes. 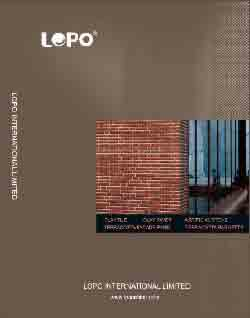 LOPO clay tile and terracotta facade have met the requirement of EU/ASTM standard. It’s our honor that more and more of LOPO terracotta products have been applying in world-class projects like Beijing Olympic facilities and “Hamburg House” in Expo 2010 Shanghai. Our products have been well-recognized by developers and distributors at home and abroad. We have established strategic partnership with noted real estate companies in China, such as Vanke, Crland, Vantong, Merchants Estate companies etc. Depending on our devoted services, qualified products and competitive prices, we have also won the approval of our distributors from overseas. 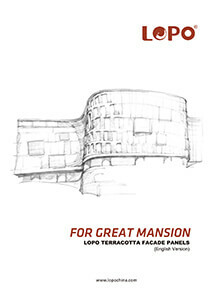 We make sure LOPO terracotta products always meet your expectation! Welcome to contact us for further cooperation!